Metcalfe is 24 kilometres south west of Redesdale. Metcalfe lies on the Coliban River, downstream from the Malmsbury reservoir. 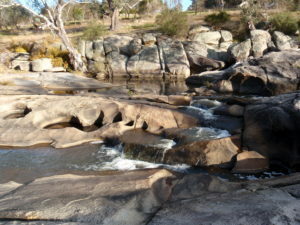 At the ‘Cascades’, just to the west of the village, the Coliban River flows over and among huge granite boulders and outcrops, creating many rock pools, small and large. The place is popular all year round for walks, picnics and swimming. The Metcalfe Tractor Pull, held in September each year, attracts participants and spectators from all over the state, and beyond.